The Arizona Junior Racquetball Programs are intended to provide ongoing State wide programs, designed to introduce youngsters of all ages, up to eighteen years of age, to the sport of racquetball and to recruit beginning level players to the competitive side of the sport. The programs are also designed and structured to maintain their interest and afford opportunities for enhanced training leading to national and world class competition. 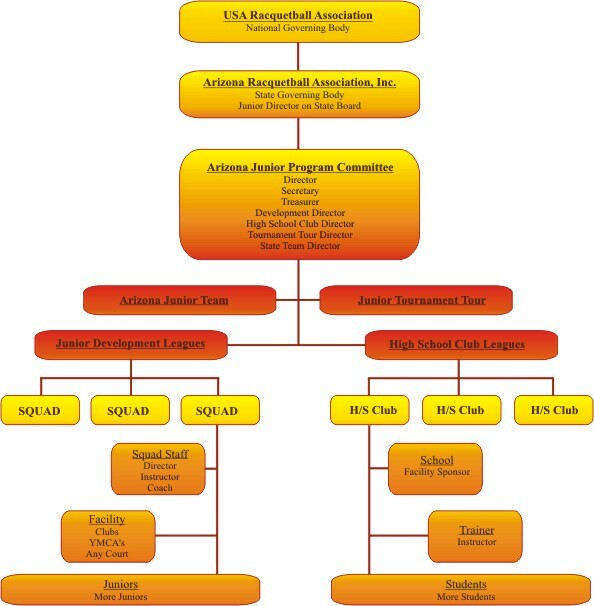 The Arizona Junior Racquetball Program is operated by a standing committee of the AZRA. The committee operates its own junior board and funding and has a representative on the AZRA Board. The State Program is consists of independently operated programs specifically tailored for the interests of the players in the program. While programs are independent, they are also mutually supporting to one another and provide a foundation for player development from the beginner to the advanced athlete. Each program will have junior sub-committees to represent the program on the Junior Board. All ages, introduction to racquetball, learning the basics while having fun, and an opportunity for friendly competition. Club teams and individuals compete against other High Schools clubs, with a great social environment, scholarships, National High School Championships. All ages, a series of junior tournaments for all skill levels. All ages, non-restrictive roster, fundraising programs, elite training camps, represent Arizona in tournament competition. This Chart depicts the structure and relationships between the different programs. Volunteers are always the backbone of any non-profit organization and our junior racquetball program is no exception. The rewards for seeing your junior grow and develop, first hand, into a mature person and also become a better player than you, are immeasurable. You are more than welcome to help us with any program in any capacity. You don’t need to be a racquetball player to be a great supporter of the sport and contribute to this valuable program. Sponsorships are available for State wide marketing aimed at juniors for a particular program or directed at the overall program through the Arizona Junior Program. Various sponsorship opportunities will be used to improve the entire program and are available for individuals, group or special interest programs. The Junior Development League’s purpose is to provide new player growth by allowing the players to learn basic skills and rules at a individual pace while emphasizing sportsmanship and how fun the game is from anywhere in the state. Leagues are formed by having a racquetball court facility to play at, Director who oversees the squad and is the point of contact to the Junior Director, Instructor who has a good understanding of racquetball skills, and a Coach who works well with juniors. There is no limit of the amount of squads the program can have. By establishing numerous squads this will ensure this program success and provide many new players to our sport. After 16 hours of learning the fundamentals and playing racquetball all the squads are invited to test their newly founded skills at a state championship venue. The program holds a special format for the juniors maximizing game play for everyone in a social and sportsmanship environment. Leagues are determined by the squad staff finding a court(s) to hold a league. The squad staff will provide the best time and day of the week to include off days to ensure they complete the 8 weeks or 16 hours prior to their tournament. Once this location and day is established it will be posted on this site for enrollment. Some locations may require you to be a member of their facility or impose other restrictions. Leagues work around three state championships each year. State singles in March, Grand Canyon State Games in June, and State Doubles in September. The league begins 8 weeks or about 2 months prior to each championship and each location date will vary. Enrolment dates are around December-January, March-April, and June-July. We will soon be taking registrations for the State Doubles 2005 Junior Development League. We first need to have the coaches register their locations and times. Please check back for the registration should begin shortly after the 4th of July holiday. The High School Club League purpose is to provide a continuation base for our younger players and new growth at the High School level, providing Arizona High Schools teams opportunities to compete among other High School in the state and at National High School Championships. Support clubs, equipment, sponsors, instructional and fund raising support. Provide leagues schedules to play other High School club teams. Establish a ranking system and awards. High School Nationals is held in March each year. Provide State and National Scholarships. We are currently working on identifying existing racquetball clubs within the high schools and the support effort of establishing new clubs. If you now have a racquetball club at your school, or interested in starting one and would like more information about our High School Club League Program please contact us. The Junior Tour is provided to maintain interest for the juniors by offering competitive competition for all junior age and skill levels, earning ranking recognition among their peers. Having a competitive forum in a program is important and The Arizona Junior Tour made up of a series of junior tournaments will give our juniors that experience. Our program has provided the ground work so when our juniors grow, the Arizona Junior Tour will be available. The Arizona Junior Team is to provide Arizona’s best and willing players to represent our State in national and international competition. The Arizona Junior Team is open to all players willing to participate along with the chance to earn national appointments to the USA team. The Team travels to various competitions annually, High School Nationals in March, Junior Nationals in June and Junior Worlds in December are just to name a few. Team Training Camps and Clinics. The campaign packages consist of chosen tournaments the junior wants to attend. The cost factor will be the estimated expenses for that junior. Driven by timelines the junior will need to raise enough money for their selected campaign. Players earn points for Arizona as a team and compete for a Junior National Title which qualifies them for the USA team. The USA team with national team coaches represents us at Junior Worlds. Players who don't qualify for the USA team can still compete at Junior Worlds. The Arizona Junior Team is open to all levels of players and must be an Arizona resident. Our goal is to expand our junior program and to grow the experiences of our junior team. This is a huge opportunity for our juniors to learn and be coached for a national level event. Being part of the team you will receive the bulleted items listed below. The International Racquetball Federation has granted the 19th IRF World Junior Racquetball Championships to Bolivia. The event will be held December 14th to 20th in Cochabamba, the city that has also hosted the 1998 IRF Adult World Championships with major success. It will be the first time that the IRF Junior Worlds will be held in South America. Before I start with today's update, I have to say...WOW what an incredible day of intense, high quality racquetball at these Junior Nationals. As you all know by now, I usually try to highlight one or two matches that stood out during the course of the day, but the reality is that today just about every division had a bona fide Match of the Day. As usual, we'll start with the Girl's 18 Singles where this match of the day was the battle between Ohio's Holly Hettesheimer and Kara Mazur of Connecticut. Although it only last two games, they were both memorable as they traded points throughout this one until late in the game each time. Holly managed to dig deep both times and earned the 15-12, 15-13 win and a semifinal date with her doubles partner, Sharon Jackson of Indiana. Sharon disposed of yesterday's upset specialist, California's Sue Sublaban in two games today. Also advancing to the semifinals were Michelle Key of Arizona and Samantha McGuffey of Ohio. In the Girl's 18 Doubles, the matches were a bit one sided as higher seeded team won both matchups in this round robin event, but those two teams Hettesheimer/Jackson and Mazur/McGuffey will square off tomorrow in what amounts to the championship match of this round robin event. There is still a chance that Key/Schnurman can throw a wrench into the plans, but at this point the two teams have separated themselves from the field. In the Girl's 16 Singles, both Sheryl Lotts of Ohio and Danielle Key of Arizona enjoyed comfortable wins today to set up their championship match tomorrow afternoon. These two played for the National Title in the Girl's 14s in Portland two years ago with Sheryl taking the title, so I'm sure Danielle is anxious to avenge that loss in front of her hometown fans. In the Girl's 16 Doubles, tomorrow will bring the championship match in this round robin event as Key/Lotts takes on Brianna Ho and Jessica Munoz. Sheryl and Danielle have looked extremely strong together this week, and I can't say that I've seen either of the other players in a match so far. Consequently, I won't make any premature predictions at this time. In the Girl's 14 Singles, the top 4 seeds have all advanced to the semifinals but the match of the day here again only went two games but was another point for point struggle as Connecticut's Samantha Rosado defeated Ohio's Lily Berry 15-13,15-12. I didn't have a clock going on this one, but it was a very long battle with some great shooting from both players. Samantha was just able to dig deeper as each game came to a close to get the win. In the Girl's 14 Doubles, there is currently a three way tie for the lead in this round robin event. Aubrey O'Brien and Lily Berry will play each of the other teams in the tie (Jackie and Samantha Rosado and Courtney Chisholm/Devon Pimentelli) in the next two days so there probably won't be a national champion decided until Sunday in this division. Each of these three teams has been playing very well this week so tomorrow's battle between Berry/O'Brien and Rosado/Rosado could be something special. In the Girl's 12 Singles, another match of the day took place in the quarterfinal between Virginia's Kelani Bailey, in her Junior Nationals debut, and yes, she is Malia's daughter, and Ohio's Abbey Lavely, a seasoned Junior Nationals participant and several time National Champion already. Abbey seemed to come out a step slow in this one and Kelani took quick advantage for a 15-2 win in game one. This seemed to fire Abbey up as she came back to the court for the second game. Jumping to a 9-1 lead, Abbey looked to be in control and ready to force a tiebreaker, but Kelani had other ideas. She slowly chipped away at the lead and even grabbed a short lived 11-10 lead, but Abbey perservered and came back for the 15-11 win to force the tiebreaker. In that tiebreaker, Kelani came out strong hitting some solid passing shots to both sides of the court keeping Abbey off balance. She grabbed a quick lead of about 5-2 and then seemed to stall. Mali a, at this point, started to get a bit nervous and was seen pacing around the court area and I just tried to stay out of the way and enjoy this match. They seemed to trade points for a while until Kelani got to 10-6. At this point, they started trading serves as neither player could get the elusive next point, but then Kelani managed to get it and Malia was the first to voice her approval. She now faces a semifinal match against Michigan's third seeded Mercedes Arias tomorrow. In the other half of the bracket, Oregon's Hollee Hungerford will take on California's Sabrina Viscuso for a spot in the finals. In the Girl's 12 Doubles, the top two teams will face off tomorrow for the National Title as Hollee Hungerford and Sabrina Viscuso will team up to take on Ohio's Abbey Lavely and Colorado's Elizabeth Vargas. Abbey and Elizabeth took home the gold in the Girl's 10 doubles last year after beating Sabrina and her previous partner in a very exciting and very long lasting final match and will have to defeat Sabrina and her latest partner if they are to gain the win in their first attempt in the Girl's 12 Doubles. In the Girl's 10 Singles, the top four seeds have all advanced to the semifinals and two of my Team Colorado players are a part of this group. Elizabeth Vargas will take on Oregon's Alecia Fladstol while Erika Manilla will challenge California's Ashley O'Brien for spots in Sunday's Finals. I watched each of these young ladies play today and all I can say is they will have some really good matches in this division tomorrow. In the Girl's 10 Doubles, we've crowned our first National Champions of this year's event as Florida's Abby Carter and Kaitlyn Simmons of Maryland completed their sweep of this round robin division with an impressive 15-2,15-6 victory over the Boyle sisters of Oregon. Congratulations to Abby and Kaitlyn! They really played great this week. In the Girl's 8 Singles, our match of the day here was the semifinal battle between Florida's Jordan Cooperrider and Michigans, Mary Zeng. These two played in the multi bounce division last year in Michigan, and I cannot recall who won. However today it appeared that Mary would be heading into the finals as she grabbed a 15-8 victory in the first game. But Jordan had other ideas as she displayed the heart that all of these kids have shown throughout this event to come back and win the next two games 15-6 and 11-4. In the Boy's 18 Singles, the top four seeds are all through to the semifinals, but not without a major scare for the second seed, Jose Rojas. In another match of the day, Jose took on Nebraska's Jacob Hutkins. I didn't actually get to see this match but if you were fortunate enough to be logged on to racquetballonline.tv this evening, then you surely saw a great match. Jacob gave it everything he had, but Jose was able to gut out the 13-15, 15-5, 11-7 win to move on to the semifinals where he'll face Richard Sledzik of Massachusetts. In the other half of the bracket, top seed Allan Crockett of Alabama will face California's Ishmael Aldana for the spot in the finals and a spot on the US Junior National Team. In the Boy's 18 Doubles, the top two seeds have advanced to the final Ishmael Aldana and Danny Lavely struggled mightily against Jacob Hutkins and Jansen Allen, but were able to fight through some struggles as they are playing a tournament together for the first time. They battled their way to a 15-14,15-9 victory and a matchup against Allan Crockett and Jonathan Doyle for a National Title and a spot on the US Junior Team. As fast as all these players are, I'm sure this final will be a lot of fun to watch. In the Boy's 16 Singles, the top four seeds have advanced and again the number two seed, in this case Oregon's Taylor Knoth played in the match of the day. Taking on his doubles partner in Minnesota's Jake Bredenbeck, Taylor survived three up and down games for the 15-3, 9-15, 11-4 victory and a match against the player he defeated last year for the 14 Singles National Title, New York's Brad Kirch. The added bonus to this match tomorrow occured today with the arrival of Hall of Famer, Jim Winterton. Jim coaches Brad and will most likely be on the sidelines tomorrow alongside Taylor's coach and also Hall of Famer, Fran Davis. So the battle will be both on the court and off in this one and I know I can't wait to see the results. In the other half of the draw, Jose Rojas will take on 4th seed Trevor Snyders of Illinois for a spot in the Final on Sunday. In the Boy's 16 Doubles, both of the semifinals were worthy of being called the match of the day as John-Craig Chisholm and Brad Kirch defeated Miguel Wiggins and Trevor Snyders in 3 tough games 9-15,15-9,11-1. Not to be outdone, Jake Bredenbeck and Taylor Knoth defeated Danny Lavely and Chad McGuffey also in three tough games. Scores were 11-15,15-4,11-2. So Brad and Taylor will meet twice tomorrow and therefore Fran and Jim will square off at least twice tomorrow as well. In the Boy's 14 Singles, again the top four seeds are into the semifinals and they all did so today in fairly comfortable fashion. So in tomorrow's semifinals, Louisiana's Joseph Lee will take on California's Marko Rojas in a rematch of a classic match that occured in 2005 in Portland. In the other half of the bracket, top seed Dylan Reid of Oregon will take on California's Jose Diaz. All of these players are definitely playing beyond their years to this point and these matches tomorrow will certainly provide some highlight reel material. In the Boy's 14 Doubles, the 4 singles semifinalists will get very familiar with each other tomorrow as the team of Joseph Lee and Dylan Reid will take on the team of Jose Diaz and Marko Rojas for the title and the spot on the Junior National Team. In the Boy's 12 Singles, yet another match of the day as Colorado's Adam Manilla took on Oregon's Joshua Lebow for a spot in the semifinals. Adam came out and built a 3-1 lead in this one and seemed comfortable, but Joshua was shooting extremely well and keeping the pressure on throughout the first game. Adam was able to score the 15-8 win, but the amount of diving that he was doing was certainly concerning me. I walked away from this match for a couple of minutes and then I heard the referree call a score of "zero serving six". Naturally, I hoped that Adam was receiving serve, but when I got back to the match I say that Adam did in fact serve that particular ball. Once I returned to that court, Adam started to chip away at the lead. He got it to 5-6 before Joshua went on another run, but Adam again fought back from 9-14 to 12-14 before Joshua was able to put the game away. In the tiebreaker, Adam grabbed an early lead and refused to allow J oshua to get too close and he pulled away for the 11-6 win and a spot in the semifinals against his former doubles partner, Sam Reid of Oregon. That barnburner will take place tomorrow afternoon, and I will definitely be there to watch that one. In the other half of the draw, Oregon's John Lindsay will take on Louisiana's Zach Wertz for the spot in the finals on Sunday. In the Boy's 12 Doubles, 3 of the four players will get very familiar with each other tomorrow as Sam Reid and his current partner, John Lindsay will take on Adam Manilla and his current partner, Florida's Sean Cooperrider for the title. Adam has won a National title in doubles in each of the past two Junior Nationals, one with Sam and one with Sean. In both cases, they were beaten in the semifinals at the Junior World Championships. In the Boy's 10 Singles, the top half of the draw provided all the drama as Jake Birnel of Washington and Colorado's Matt McAdam met in yet another match of the day. Three very tough games ended with Jake squeaking out the 9-15,15-10,11-10 win and a spot in the semifinals against Matt's doubles partner, Sam Bredenbeck of Minnesota. Sam upset the top seed, Kyle Ulliman of Ohio to earn his spot in this matchup. The other half of the draw has played to form as second seed, Spencer Shoemaker of Ohio will take on third seed Ryan Francis of New Hampshire for the spot in the finals. In the Boy's 10 Doubles, the top two seeds have advanced to the finals as Ohio's Shoemaker/Ulliman will take on the Minnesota/Colorado combo of Bredenbeck and McAdam for the title. In the Boy's 8 Singles, the seeds really didn't hold here as only the top seeded Justus Benson of Wisconsin was able to secure a spot in the semifinals. In that semi, he'll face another Bailey in Malia's son, Warren. The other half of the bracket pits Minnesota's Jordan Barth against Oregon's Daryl Wainwright. Tomorrow is going to be an amazing day of racquetball, but at the same time there will be many great joys and many great sorrows as the 2007 US Junior National Team will be determined, with the possible(more likely probably) exception of the Girl's 14 Doubles. While it is great to see the exhilaration that comes to the winners, sometimes it can be hard to watch the devastation that befalls the vanquished. Every player played at least one match today at the 34th USA Racquetball Junior Olympic National Championships presented by Penn Racquet Sports and the matches were all very entertaining. In the Girl's 18 Singles, they are down to the quarterfinals as all the higher seeds advanced with the exception of the 6th seed, Brittany Leggett of Oregon. Playing California's Sue Sublaban, Brittany's 1 year absence from Junior Nationals showed as Sue fought through 2 very tough games and the 15-14, 15-11 victory. Next up is the 3rd seed, Sharon Jackson from Indiana. In the Girl's 18 Doubles, there was a very highly anticipated matchup as the reigning 16 World Champions, Holly Hettesheimer of Ohio and Sharon Jackson of Indiana took on Michelle Key of Arizona and Gabrielle Schnurman of Iowa. Again in two tough games Holly and Sharon were able to gain the 15-11, 15-9 victory and now can start to look forward to Saturday's match with Kara Mazur and Samantha McGuffey who are the defending champions in this division. The Girl's 16 singles continued their round robin today as both Sheryl Lotts and Danielle Key earned 2 game wins to inch a step closer to their meeting on Saturday which could determine the champion in this division. In the Girl's 16 Doubles, Danielle and Sheryl teamed up to gain an impressive victory today. I only saw a little of that match so I don't have the scores but they looked very much in control for that part that I did see. The Girl's 14 Singles are now down to the quarterfinals and the match that caught my attention here was Ohio's Lily Berry taking on Idaho's Savannah McVay. Lily earned her first appointment to the US Junior Team last summer in Michigan and looked very much like she wanted to re-qualify for the team as she rolled to a 15-1, 15-1 victory. I honestly don't recall her missing a single shot in this match as she powered her way into a meeting with Connecticut's rising star, Samantha Rosado tomorrow. In the Girl's 14 Doubles, we had a definite Match of the Day in the battle between the Rosado Sisters and Courtney Chisholm of Massachusetts and Devon Pimentelli of California. Courtney and Devon started this one very strong to gain the 15-6 win in the game one, but found themselves down 11-3 quickly in the second game. It appeared that this was headed to the tiebreaker, but they fought back with all they had to knot the score at 14. As they clearly had the momentum it looked like this one would now end in two, but they lost the serve and during a long rally, the ball struck Courtney after Devon had played her shot and just like that, we were on to the tiebreaker. That tiebreaker consisted of 2 big runs. Courtney and Devon went ahead 2-0 before Jackie and Samantha put together a 7 point run. When Courtney and Devon returned to the service box, they ran 7 points themselves before we settled into a 9-7 score for a full service rotation. Jackie and Samantha would get to 8, but they would get no more as Courtney and Devon finished the 11-8 win and can now start to think about their Sunday meeting with Aubrey O'Brien from California and Ohio's Lily Berry. The Girl's 12 Singles will kick it into gear tomorrow with the quarterfinal matches. There was one match in this division today, but I didn't see it. I do know that Sara Leon of California beat Arizona's Nicole Ortega, but I don't have any other information on that match. The Girl's 12 Doubles also played one match in this 3 team round robin as Oregon's Hollee Hungerford and California's Sabrina Viscuso defeated Oregon's Fladstol Sisters, Alecia and Victoria in two close games. The Girl's 10 Singles also played one match today to set up the quarterfinals tomorrow as Kaitlin Simmons from Maryland defeated California's Julia Lanman. In the Girl's 10 Doubles again just one match played as Kaitlin joined her doubles partner, Abby Carter of Florida to defeat the California team of Ashley O'Brien and Julia Lanman. In the Girl's 8 Singles, they are down to the Semifinals as Ohio's Christina Lavely won a very tough match over Oregon's Sierra Reid by scores of 15-12, 5-15, 11-5. That victory sets up a semifinal with top seed, Erika Manilla of Colorado. The other half of the bracket has Florida's Jordan Cooperrider taking on Michigan's Mary Zeng. On the Boy's side in the 18 Singles today, they are to the quarterfinals and I have to say that the top 4 seeds are all looking very impressive. None of them has dropped so much as a game to this point, but I would have to give a slight edge to Jose Rojas who just looks like he is totally in control of his matches from the moment he walks onto the court to warm up. He certainly has an air of confidence about him and yet he is the most humble individual away from the court. I talked with him briefly today and you would never know that he is just plowing through the field at this point. In the Boy's 18 Doubles, they are also down to the quarterfinals and the top 4 seeds again are looking very strong as they haven't dropped a game between them yet. I haven't seen any of these matches yet, but will make a point to do so tomorrow. In the Boy's 16 Singles, they are down to the quarterfinals and Jose Rojas is looking extremely dominant in this divison. The matchup that I am looking forward to, however, is the quarterfinal between doubles partners in Oregon's Taylor Knoth and Minnesota's Jake Bredenbeck. This should be a great match tomorrow, and is my early candidate for Match of the Day. In the Boy's 16 Doubles, they are down to the semifinals and the top four seeds will battle it out. The match that I'm looking forward to in this one is the 2-3 battle of Taylor Knoth/Jake Bredenbeck against Ohio's Danny Lavely and Chad McGuffey. Danny and Chad won the World title in the 14 Doubles 2 years ago and Taylor and Jake just missed with a silver medal performance in the 14 Doubles last year, so this has the potential to be a very special match. In the Boy's 14 Singles, again they are down to the quarterfinals and the top four seeds are looking very impressive. Dylan Reid of Oregon had a very good match today with Chase Stanley of Louisiana. I was very impressed with both players ability to retrieve seemingly killed shots, but in the end Dylan's consistency and strong shot selection kept his title hopes alive 15-10, 15-2. In the Boy's 14 Doubles, they are down to the semifinals and it is looking like a finals showdown between Joseph Lee of Louisiana and Oregon's Dylan Reid and the California team of Marco Rojas and Jose Diaz. These two teams have just appeared to be a level better than anyone else in this division. In the Boy's 12 Singles, they are down to the quarterfinals and Team Colorado's Adam Manilla is still on track in his quest for 2 gold medals. Adam played some absolutely great racquetball today to gain a hard fought 15-10, 15-3 win over California's Sawyer Lloyd. After that first game, Adam just seemed to turn it up another gear and Sawyer had no response. Also looking very strong today was the second seed, Sam Reid from Oregon. In the Boy's 12 Doubles, they are down to the semifinals and the top two seeds have advanced but 3 and 4 were sent packing today. In the Boy's 10 Singles, they are down to the quarterfinals and again a Team Colorado player has kept alive his dreams of 2 Gold medals. This time, it is Matt McAdam who looked very impressive in his 15-4, 15-1 victory over Wisconsin's Justus Benson. In the Boy's 10 Doubles, they are in the semifinals and there is another Diaz/Rojas California combination looking to take home the title. They'll play the top seeds tomorrow and that match could be another match of the day candidate. In the Boy's 8 Singles, they only had a couple of matches today and I didn't see either one. They, like all the rest, are down to the quarterfinals. As I wrap up today's recap, I must say that I am extremely impressed with the overall level of play of each and every one of these players. There may have been some lopsided scores on the scoresheets, but points have still been difficult to come by. When all is said and done the players that will win the National Title in each division will have truly earned it. The action kicked off bright and early this morning at the Student Recreation Center on the campus of Arizona State University, but I spent most of the day catching up with my "racquetball family". So first, I will give everyone a look at the seeds in the divisions this year. Of course, this year everyone wants to earn that appointment to the US Junior National Team as the Junior Worlds will be held in Cochabamba, Bolivia this coming December. Spots will be earned by the finalists in each of the World Cup divisions, and those are the 14s, 16s, and 18s for singles for the girls and the boys. There is still a great deal of debate about the Doubles teams, but my understanding is that the winning team in those same age groups will still earn a spot on the team, but their ability to join the team for the Junior Worlds in Bolivia will depend on fund raising. As I generally try to avoid the political aspects of the sport with these updates, I won't be sa ying anymore about that. After all, this tournament is all about the children and I'm all for that. In the Girl's 18s, defending National and World Champion Michelle Key, from Arizona is the top seed. I spoke with her earlier today and she is looking forward to the challenge of defending both her titles and she got her tournament off to a good start by winning her 1st round in the Girl's 18 Doubles, which this year is a 5 team round robin. The second seed is Connecticut's Kara Mazur, who is a member of the National Championship team from the University of Alabama. Third seed is Sharon Jackson from Indiana, who swept the 16s last year and is looking for the repeat in her first year in the 18s. The fourth seed is Ohio's Samantha McGuffey who just wanted to play today. She'll get that chance tomorrow. In the Girl's 16s, there is a 5 person round robin in the singles where Sheryl Lotts of Ohio and Danielle Key from Arizona are the seasoned Junior Nationals participants and Junior Team qualifiers. The Girl's 14s is certainly loaded this year and should provide some great matches in the days ahead. Top seed is Aubrey O'Brien from California. She is also the defending champion and runner up from Junior Worlds. She is very motivated to earn another spot on the team to try and win that elusive World Title, as many of you will recall the final of the Girl's 14s at Junior Worlds was one of the best matches of the tournament. The second seed is California's Devon Pimentelli. She won the 12s last summer in Michigan and got her tourney off to a good start today in the doubles with a fairly comfortable win. The third seed is Samantha Rosado from Connecticut and the fourth seed is Courtney Chisholm from Massachusetts. In the Girl's 12s, Oregon's Hollee Hungerford is the top seed as she takes her Gold Medal from the 10s last summer up into the 12s. Last year's beaten finalist in the 10s, Ohio's Abbey Lavely, is the second seed and she is hoping to reverse the order this year. The third seed is Mercedes Arias from Michigan, and she is my early pick to be the player of the tournament. The fourth seed is Samantha Simmons from Maryland, and I have to admit that I am not very familiar with this young lady. In the 10s, Team Colorado's Elizabeth Vargas leads the way as the top seed. She actually played up in this division two years ago, so she is now in her third year looking for that elusive national title that would go so well with the bronze and silver medals she has earned the last two years. The second seed is Ashley O'Brien from California, she has made great strides from last year and is looking to follow in her sister Aubrey's footsteps with a title. The third seed is another of my Team Colorado juniors in Erika Manilla. She spent the day wanting to play, but her first match isn't until tomorrow. The fouth seed is Oregon's Alecia Fladstol. In the 8s, Erika Manilla is looking to defend her title that she earned last summer. Since I do get to work with her and see her practicing, I know how determined she is and I'm just glad that I don't have to play her. On the Boy's side in the 18s, defending champion Allan Crockett from Alabama leads the way. He was largely overlooked last year as he was in his first year in the 18s, but that didn't stop him from a very convincing win. He's being overlooked again so we'll just have to wait and see if he can successfully defend his title. The second seed is Jose Rojas from California who looks very determined, and he's going to have to be as he is also playing the Boy's 16 singles and these are the two biggest draws in the tournament. Chances are he'll be playing at least two full matches in each division for each of the next two days. I did speak with US Adult Team Head Coach, Dave Ellis, today and he said that Jose just can't get enough racquetball so the prospect of 4 matches in a day doesn't phase him one bit. The third seed is Rick Sledzik from Massachusetts who is in his final year of Juniors eligibility. The fourth seed is the World Champion fr om the 16s, Ishmael Aldana. I spoke with Ishmael today and he is very quietly confident, which is very much his style. In the Boy's 16s, Jose Rojas is the top seed and defending Champion. Last year Jose and Ishmael split Nationals and Worlds and the difference was an 11-10 tiebreaker to Jose at Nationals and an 11-9 tiebreaker to Ishmael at Worlds. The second seed is Taylor Knoth of Oregon, who is moving up from the 14s and has some pressure already lifted as he has earned a spot on the US Junior National Team by virtue of his victory in March at the High School National Championships. The third seed is Brad Kirch from New York. He was the beaten finalist in the 14s last summer. The fourth seed is Trevor Snyders from Illinois. In the Boy's 14s, another loaded division as Oregon's Dylan Reid has earned the top seed, but that just means a meeting with Louisiana's Chase Stanley who is back at Junior Nationals after a 2 year hiatus. That match goes tomorrow and is an early candidate for match of the day. The second seed is Louisiana's Joseph Lee who is always in the hunt at Junior Nationals. The third seed is Marco Rojas from California and he is just as hungry as his older brother, Jose, for that trip to Bolivia and Junior Worlds. The fourth seed is Jose Diaz from California, and he is looking to put a somewhat disappointing Junior Worlds behind him at this tournament. In the Boy's 12s, John Lindsay of Oregon leads the way as top seed. John is all heart on the court and I know that he will give it everything he has to get the title. The second seed is Sam Reid from Oregon he also is John's doubles partner in that event. The third seed is a familiar player to those of you that regularly read these updates, he's my Team Colorado player and Ektelon's Junior Athlete of the Year, Adam Manilla. Adam swept the 10s last summer and has been playing extremely well lately, so I look forward to reporting his progress to you this week. The fourth seed is California's Bobby Sehrgosha, the beaten finalist in the 10s last year. In the Boy's 10s, Ohio looks to have a stranglehold on this one as Kyle Ulliman and Spencer Shoemaker, respectively, have the top two seeds and they will be playing doubles together. The third seed is Ryan Francis from New Hampshire and the fourth seed is Jake Birnel from Washington state. Those two are moving up from the 8s where they were the finalists last year. In the Boy's 8s, Justus Benson of Wisconsin has earned the top seed ahead of Indiana's Sean Henry, California's Mauro Rojas, and Ohio's Christian Ulliman. As I said, I didn't see that many matches today, but some players that stood out were Minnesota's John Behm who took out the Third Seed today. Also, Mitchell Hardin of Ohio played very well in squeaking out an 11-8 tiebreaker win in the 12s today against Sean Cooperrider. The state competition this year promises to be very exciting as Oregon looks to regain the title after California ended their 14 year run last year in Michigan. Oregon brought 38 players this year to try and take the crown back, but California isn't going to give it away that easily as they brought 31 players themselves. Also in the hunt this year will be Ohio with 22 players and Arizona which brings 20 players to these championships. A sleeper that is coming up through the ranks could be Florida and their 14 players. A kudos has to go to Kim Roy down in Florida for putting together such a large team and bringing them out to Arizona. From all of us in Arizona- CONGRATULATIONS! !